The road name ”Taikayön tie” alludes to magical nights when anything can happen. For hundreds of refugees the dream has already become reality. They have been selected as quota refugees to come to Punkalaidun. The first Finn they meet is often Maarit Tiittanen. She is the municipality’s only employee at a project which is unique in Finland. She meets them at the airstrip, drives them to their new home, helps install them in a completely new world, creates networks which make a new start possible. For the Burmese, Syrians or Ethiopians, the most common nationalities, most things are new. There are many practical things to learn, in addition to the need for learning to read and write Finnish very quickly, in order to get a job and Finnish nationality. Maarit Tiittanen and Shady Almohamed from Syria. The municipality also houses a refugee centre, with space for 200 asylum seekers waiting for protection in Finland. The municipality owns the house where the Red Cross is running things. Not many stay there for longer than necessary. Many of those granted asylum want to move to the capital region. Those who are refused asylum are expected to leave the country. That is a very topical issue in Finland following last year’s large stream of refugees. There is also the question of who looks after those who after all will be staying. That can also become a task for Maarit Tiittanen. But her job is already vast, with the nearly 100 quota refugees. Punkalaidun definitively looks like a prosperous agricultural municipality, even in the middle of winter. Large areas of arable land. Milk production. Pig farms. Some sheep farms. Well tended farms. But there are also empty, derelict houses. A lot has happened to the municipality. Even before Finland joined the EU, the small farms started disappearing and the fields were divided up. There were no jobs in the cities. Sweden attracted labour. Finland devalued its markka currency by 30 percent. In just one year towards the end of the 1960s more than 40,000 Finns moved to Sweden. They also left Punkalaidun. Only a few returned. The municipality is now worryingly close to having no more than 3,000 citizens. There has been an annual fall of some 50 people. In this place the dying have for many years outnumbered the newly born. A few years ago Punkalaidun nearly gave up and was preparing to merge with the neighbouring municipalities. But the municipal council said no. All this might explain why the refugees are so welcome. Punkalaidun has got several awards for “exemplary promotion of ethnic relations”. The municipality is already in its second EU LEADER programme. First, an integration model was developed through the project 'Immigrants to the countryside;' from 2011, later it continued with 'Immigrants and everyday life in the countryside' which develops integration and service. For several years now, the municipality has accepted quota refugees and developed its own integration models. These have included creating networks for lectures, the third sector and the municipality, so that the newcomers can get an education, jobs and help to get going. One of the municipality’s largest employers is SHT-Tukku, the company which makes and imports everything that Finland’s funeral bureaus need. Flowers, decorations and coffins. The factory employs around 100 carpenters who build a vast array of coffins, but who also make toy furniture and other wooden produce. Most Finns want cloth covered coffins in cheaper wood, but here they also make many other models. The newest one is a boat model designed by Risto-Matti Ratia, for the last journey. Burmese quota refugees who has found work here. Her family came from Burma’s refugee camps in 2008 and after a few years got an education, their own house, jobs and Finnish citizenship. 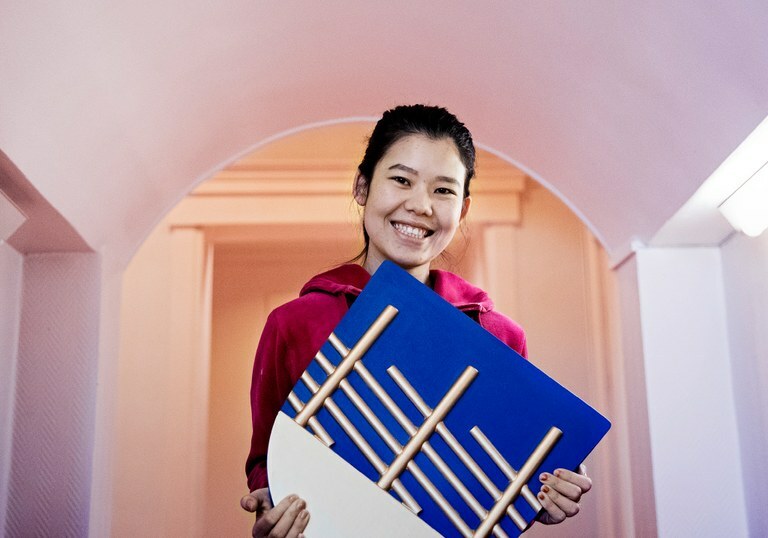 She proudly puts the flag logo in place which signifies that the coffin she decorated is of the best Finnish quality. She has represented the Punkalaidun model several times, serving as an example of how successful integration can work in the countryside. SHT-Tukku are behind a sizeable part of Finnish coffins. There are a few hundred smaller factories and some Chinese cheap imports. “Here you are proud of your handiwork and rarely think much about the fact that dead people will be put in these coffins,” thinks Jari Leminen. Most people need coffins, regardless of their faith. Around ten of the current employees have foreign backgrounds, a welcome addition to the staff. Jari Leminen chooses his words carefully. He choses the best skilled people, regardless of nationality or heritage. He has not heard any of the criticism which sometimes is found in Finland about “foreigners coming to take Finnish people’s jobs”. It is not true, either. Refugees are considered to be a resource here. That seems to be the common view among businesses. Yet so far the immigrants do not seem to have a place in future municipal plans for business development, neither as innovative businesspeople, multicultural export contacts or consumers. Newcomers are more visible in the population structure. It is not easy to integrate immigrants into rural municipalities, says the delegation for ethnic relations at the Ministry of Justice, which recently praised Punkalaidun municipality. It is not easy to get into Punkalaidun, say many newly arrived citizens. But these are mainly the Finns who have come here, even those arriving from the neighbouring municipality. Maarit Tiittanen agrees, She runs the project to get immigrants to enjoy settling into the municipality. A lot is clearly about her as a person, the network she has managed to build and the optimism and willingness which seems to be everywhere. “It’s not an eight to four office job, I get phone calls at all hours about the most unexpected problems which might arise,” she confides. The day we are visiting they are staging an outdoor day. Two families – from Syria and Myanmar – are keeping warm by the bonfire before trying to ski for the first time in their lives. It does not go at all well. Their skis are far too slippery. Shady and Waled Almohamed are the bravest, ignoring the happy laughter form the onlookers. The concept of snow and ice is foreign to the family coming from Syria via the refugee camps of Lebanon. After a year in Punkalaidun, the Finnish language is still the greatest problem. It is hard. They are getting used to Finnish foods and traditions. The family Almohamed are more surprised over how difficult it is to get contact with Finns in their homes. Both the parents and the three sons still assure us everything will be fine, and praise Maarit Tiittanen for helping at every junction. An old press cutting still reveals that this family too at first was met with anger from some locals who did not like the newcomers. Maarit Tiittanen admits there have been problems. But this too seems to work better now. In the stylish town hall we meet two Finns Party politicians and one from the Centre Party. The two parties are the biggest in the municipality, just like they are in the government together with the National Coalition Party, which is the third largest also here. In the latest municipal elections the Social Democrats lost two mandates, half of what they had, and the Left Alliance has one. The Finns Party won large, while the Centre Party is the largest party. “Agriculture has changed a lot, and the need for labour has been shrinking since the 1960s when farms started merging. Outi Uusi-Kouvo herself moved here from a neighbouring municipality, married into a farm, but with a job as an accountant on the side. She understands the challenges of establishing yourself in a foreign place, and if you come from the outside with a different language it is even harder. But the immigrants are welcome. The Finns Party members, Ari Prihti who is head of the municipal board, and Martti Mölsä who is a municipal councillor and a member of the Finnish parliament, agree too. The two of them agree that some of their fellow party members are critical to that point of view. As a party, the Finns Party have been called immigration critical, and certain members go much further in their criticism of foreigners coming to Finland. On a municipal level the politicians agree on most things. Disagreements might emerge a few weeks before and after municipal elections, but afterwards they again work for the best of the municipality. There is no power struggle here, according to these three politicians. When the municipality first bought the big house which was later rented out to the Red Cross as accommodation for refugees, it created debate in the municipality, says Martti Mölsä. Now people know that it is an advantage for the municipality to be able to rent the house out. And the school knows what is needed to quickly welcome new pupils from foreign cultures. Most of the asylum seekers disappear when they are told about the result of their application, but the quota refugees are a different matter. “They have adapted so incredibly well,” says Outi Uusi-Kouvo, and Ari Prihti agrees. There are no economic calculations showing how receiving refugees influences the municipality. But the three municipal politicians seem to agree that it is beneficial. Education and health services cost money, for sure, but the state compensates for most of the costs. The local service sector of course hopes for more customers and bigger revenues. According to Martti Mölsä you can see how there is more life and colour along the municipality’s roads. Yet he brings up the fact that some asylum seekers went on steeling sprees in and outside of the municipality. Mölsä also reminds us of the Finns Party slogan: Help people where the problem occurs in their home countries, it is far more expensive to receive refugees in Finland. Ari Prihti, himself a sheep farmer and businessman, points to the benefits the immigrants bring. “We need labour. Punkalaidun has the region’s lowest unemployment. The Myanmar refugees are particularly good employees, there are children arriving who fill up the schools, there are many good things,” says Ari Prihti. Outi Uusi-Kouvo is hoping for a win-win situation which benefits both the municipality and the immigrants. Yet whether the municipality does this for economic benefit or out of humanity is a difficult question to answer. “It really doesn’t hurt feeling like a good person,” as Outi Uusi-Kouvo puts it. Many other refugees have left the municipality after a few years, but those from Myanmar have stayed. It is also not the case that all refugees from big cities prefer to come to Finland’s big cities. If you have been living in primitive refugee camps, Punkalaidun is also a luxurious place, points out politicians and refugees both. The Finns Party in particular have been criticising fortune seekers who, according to common belief only expect benefits and getting everything served on a plate. “Much depends on your expectations and the information you already have. Many asylum seekers have very high expectations,” says Martti Mölsä. People smuglers have given them the wrong information and taken them to the wrong countries. But quota refugees know where they are going and what is expected from them. Neither Prihti nor Mölsä likes the comparison with the tens of thousands of Finns who moved to Sweden in the 60s and 70s. Many moved to Turku and Helsinki too. People have always moved across borders from one country to another, in the hunt for a better life. But they were not welfare refugees. They went to Sweden to work, not to sign on, says Prihti and Mölsä. In April Finland holds municipal elections. Ari Prihti proudly shows one of the candidates for the Finns Party. It is Sun May Htoo, who has lived in the municipality for seven years and is now a Finnish citizen. She is meant to garner the immigrant vote. Sun May Htoo has the same experiences as most other newcomers. She praises the municipality’s focus on the refugee project and Maarit Tiittanen’s efforts. If Sun May has experienced anything unpleasant in Punkalaidun, there is nothing she wants to tell us about. She is now working as a personal assistant and manages well in Finnish. Why she chose the Finns Party remains unanswered, however. "The welfare model is vulnerable to high levels of immigration of adults with low skills levels." A municipality in South-western Finland, in the region of Pirkanmaa, some 150 kilometers north-west of Helsinki. 3,004 inhabitants. The municipality of Punkalaidun has the best employment figures in the region: In November 2016 there were 123 unemployed job seekers, or 9.6 percent. The situation in the nearest larger city, Tampere, is considerably worse: 19,894 unemployed, 17.4 percent. The region’s average unemployment figure is 14.6 percent, i.e. a few percentage points higher than the national average of 12.5 percent. 60-64 year olds are overrepresented among the unemployed. 200 asylum seekers live in an asylum centre in the municipality, run by the Red Cross. Some 100 quota refugees and labour immigrants are being looked after by the municipality.